Amanecer Yacht Charters provides the ultimate yachting experience to the luxury traveler in Puerto Vallarta and Punta Mita. With its temperate climate, calm waters, and the exquisite bay, the Western Coast of Mexico is the ideal location for a day of luxury cruising aboard our yachts. Enjoy spectacular views of the coast line, cityscape, and mountain ranges aboard the most elegant and finely-crafted yachts available on the Mexican Riviera. Access secluded beaches and private coves while you bask in the comfort and style of our elegantly designed and impeccably maintained vessels. 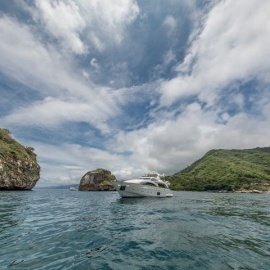 Whether you seek the adventure of exploring tropical sea life or the relaxation of anchoring in a tranquil fishing village, Amanecer Yacht Charters provides a unique and exclusive experience, only available to the most discriminating travelers in Puerto Vallarta and Punta Mita.